...to create the Most Complicated Watch in the world. 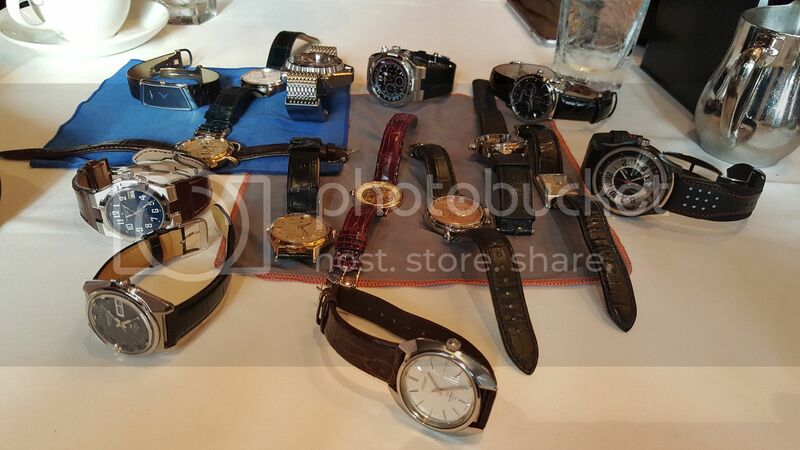 First, some pics of the movement and watch itself, then a detailed guide to the complications followed, finally, by the official press release (which is long, I am just warning you). Reference 57260 is a double-dial horological masterwork of hitherto unimaginable complication and technical innovation. It was developed over a period of eight years by a team of three of the company's Master Watchmakers. Made using the classic principles of watchmaking along with resolutely 21st century thinking, this watch is an original creation exhibiting a total of 57 complications, several of which are entirely new and unique. 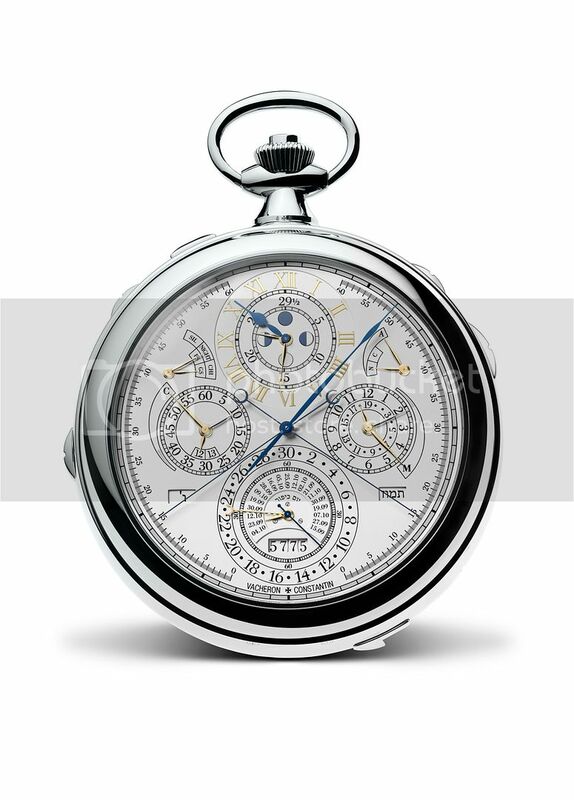 The new complications that were required to be incorporated including, amongst others, the multiple calendars and double retrograde rattrapante chronograph, had never previously existed and therefore had to be calculated, designed and developed from scratch, thus a completely new calibre was created. This meant the creation of an entirely new type of movement unlike any other seen before. Furthermore, even the mechanisms of the more familiar complications have been modified, reinterpreted and redesigned so that the finished watch is utterly harmonious as a whole. Its conception and realisation required not only a huge leap of imagination but a level of mathematical understanding and craftsmanship that is almost beyond comprehension. The successful completion of this watch has introduced several important brand-new complications to the world of watchmaking and as such the research and skills developed during its construction can be considered to be the greatest contribution to the advancement of mechanical watchmaking since the 1920s. 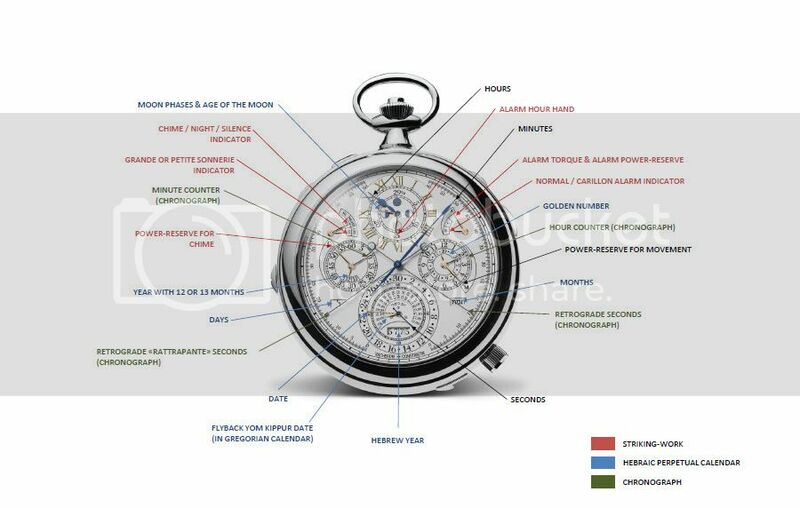 Amongst the list of fifty-seven complications are a significant number of ingenious and important new mechanisms. These new Vacheron Constantin innovations are found in every aspect of the watch's construction, within which each function has its application in watchmaking both as an individual technical development and as an integral part of this extraordinary watch. Made of solid 18-carat white gold, polished with glazed bezels on each side, the elegant and perfectly proportioned case has a three-position winding crown with corresponding indication window on the case band to show the position of the crown during winding or setting. A co-axial button in the crown controls the start/stop and return-to-zero functions of the double retrograde chronograph and the push-button in the case band at 11 o'clock activates and restarts the rattrapante chronograph function. Of particular note is the totally unobtrusive and new design of the concealed flush-fit alarm winding crown located in the case band at the 4 o'clock position. This is a most sophisticated method of concealing the alarm button so that it does not detract from the clean line and elegance of the case. Each side of the watch has a dial made of solid silver, while the rotating discs for the displays are made of aluminium so as to be lightweight and therefore require only the slightest energy to move. The meantime dial is of regulator style, displaying the hours, minutes and seconds on separate chapter rings, a design derived from precision regulator clocks such as those used in observatories and laboratories. This first dial displays some of the entirely new and very exciting functions developed by the Vacheron Constantin watchmakers and seen for the first time ever in this watch. Of the utmost technical and mathematical complexity, the Hebraic perpetual calendar can truly be considered to be one of the greatest contributions to mechanical watchmaking of recent times. Due to the long-term changing cycles of the Hebraic calendar and its difference to the Gregorian calendar, the making of a complete functioning mechanical Hebraic perpetual calendar in a watch has been impossible until now. Highly complicated mathematical calculations combining both the lunar months and solar year were transcribed into not only an operational mechanism but a display that is elegant, logical and easy to read. This achievement cannot be overstated as an example of contemporary watchmaking genius. The Hebraic perpetual calendar works on the principle of the 19-year Metonic cycle because 19 years it is almost exactly a multiple of the solar year and lunar month over that period. On this watch, the Metonic cycle (also called Golden Number) is displayed as a sector at 3 o'clock concentric with the chronograph hour register. The sacred date of Yom Kippur indicated in the Gregorian calendar each year, is represented by the corresponding retrograde hand at 6 o'clock, which returns to its starting point every 19 years, at which time the sector is replaced for another for each of the 19 year cycles. To keep the 12-month lunar year in pace with the solar year, a "13th" leap-month called an intercalary month has to be added seven times during the 19-year cycle. Ingeniously, this watch not only allows for this addition but also shows the user whether the current year is a 12 or 13-month year via an indicator hand and 12/13 display situated concentric with the chronograph minute register and counter hand in the 9 o'clock position. Within the centre of the hour chapter-ring are four representations of the moon phases and also a hand indicating the age of the moon within its 29.5305882 day cycle. 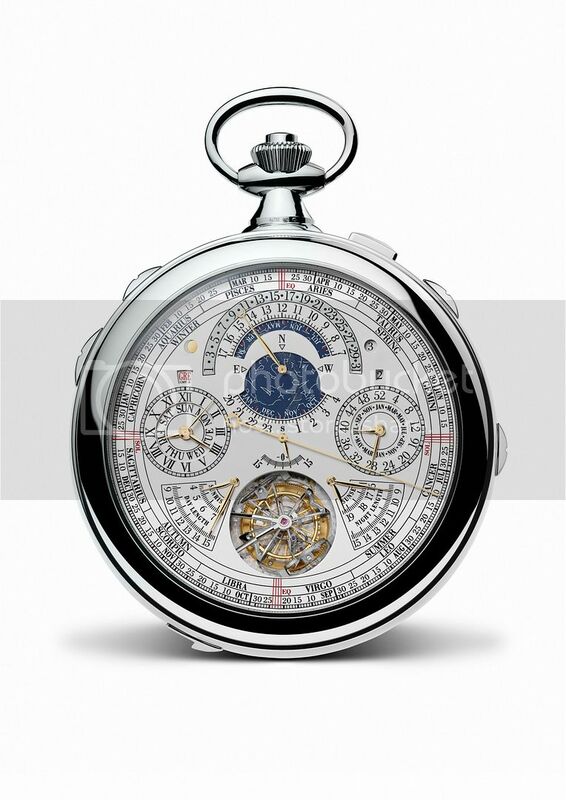 The Vacheron Constantin moon phase system requires correction only once every 1027 years. Completely new to the world of watchmaking, the bold and visually dramatic Vacheron Constantin retrograde rattrapante chronograph is of a totally innovative design and construction. This is the first watch ever to be made with a rattrapante chronograph with double retrograde action. 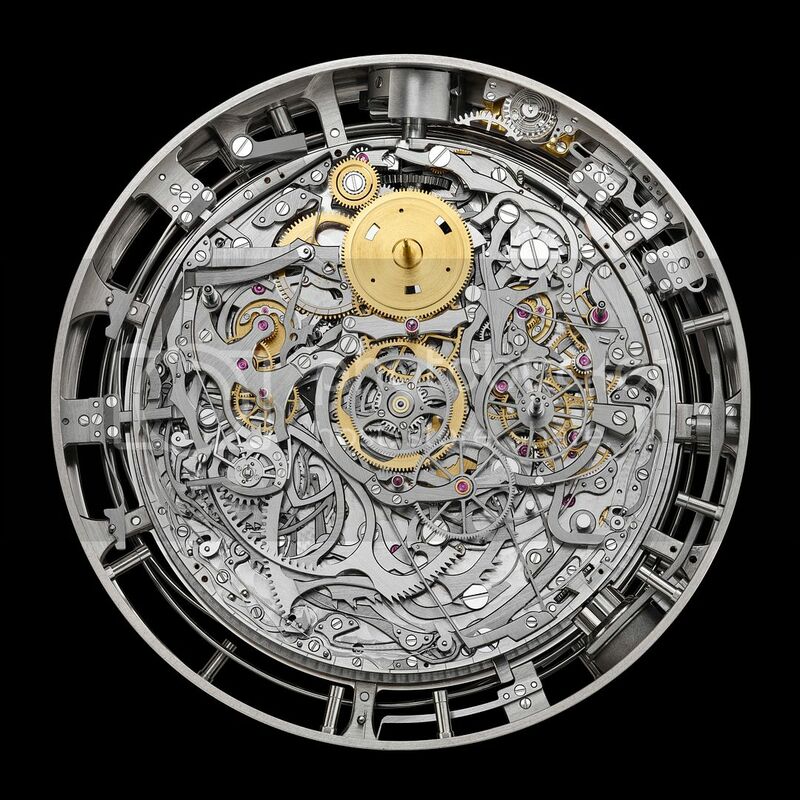 It is not only a highly visual complication but mechanically ingenious. This new chronograph is read by the user exactly in the manner of a classic split-seconds chronograph; uniquely however, whilst both hands still work in unison and from the same axis, unlike all other split-seconds chronographs, the two hands never actually meet but operate on two separate scales on opposing sides of the dial. In this respect, the new chronograph can perhaps be best described as a "detached" split-seconds chronograph. To create this function, a new chronograph mechanism has been invented and made entirely in-house at Vacheron Constantin specifically for this exceptional watch. 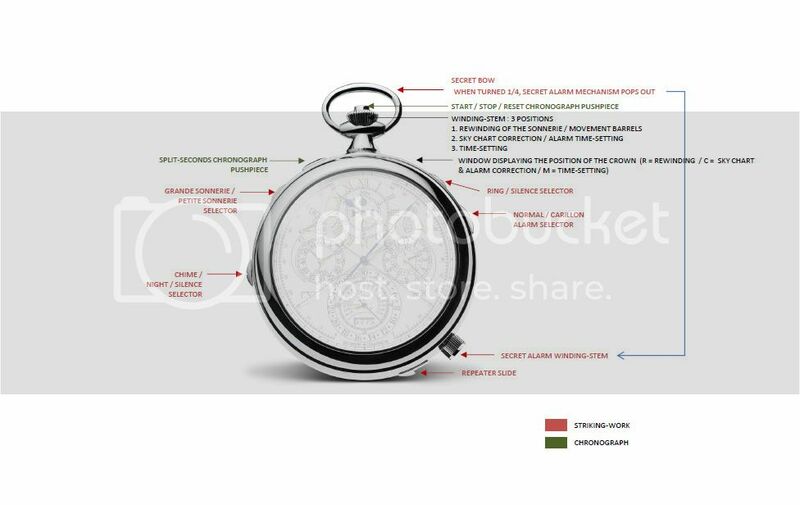 In addition, it has been necessary to specially design and make the two long and very fine chronograph hands so that the chronograph has perfect stability and extreme accuracy during operation. 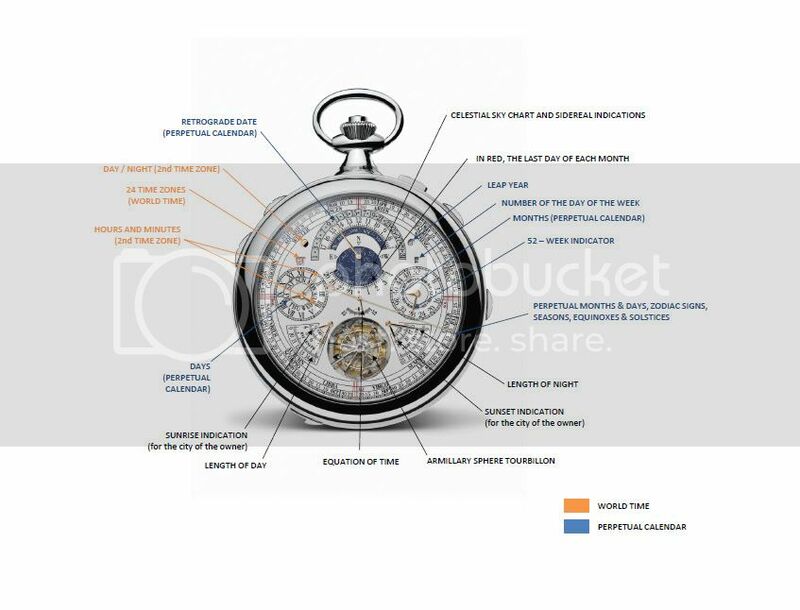 This detail illustrates just one of the myriad of highly complex calculations and watchmaking skills required in the design and making of every aspect of this watch in which even the smallest of details has been meticulously determined. There are two register dials for the chronograph counting each elapsed minute up to 60-minutes and each elapsed hour up to 12-hours so that events of up to 12-hours in duration can be accurately recorded. indicator. These are unsurprisingly highly sophisticated and incorporate new and unique watchmaking inventions and innovations. 2. Night silence chiming automatically disabled from 22h to 8h (described in more detail below). There are two additional options to choose from; Grande sonnerie - striking the hours and the quarters at every passing quarter and alternatively Petite sonnerie striking the full hours at the hour but only a quarter-strike without hours on the quarters. To repeat the chiming at any time, the slide on the band of the case can be activated whenever it is desired by the user. A unique and very user-friendly new feature has been developed especially for the chiming system of this watch, that of the automatically activated "Night-Time Silence" mode. A special system has been developed by Vacheron Constantin and built into this watch whereby (in this instance) between the hours of 10pm at night and 8am in the morning it does not chime in order not to disturb its owner. This system is unique in being the first to be automatically activated without the need to manually set the chime or silence option. The alarm is set via the winding crown which moves an additional alarm hand co-axial with the hour and moon's age hand. The flush-fit winding button is situated in the band of the case. by a digital world-time display, a double perpetual calendar and a remarkable fully visible armillary sphere tourbillon. The blue star chart in the upper half of the dial represents the night sky and the star constellations visible from the user's home city, with the months appearing around the edge. Concentric around the outer border is the scale for the retrograde date of the perpetual calendar, the hand "flying" back to its start point at the end of each month. Subsidiary dials for the days of the week and the months flank the star dial and the aperture above the month dial shows the number of the year between 1 and 4 in the leap-year cycle. Around the edge of the dial are three astronomic scales which are read using the central gold hand identified by its sun counterpoise. The outermost scale is for the months of the year and their respective number of days, while a concentric scale for the year divided into Zodiac sign periods additionally indicates the dates of the Vernal and Autumnal Equinoxes and the summer and winter solstices. The inter-related four seasons are displayed on a further inner concentric ring. The sector above the tourbillion aperture indicates Equation of Time showing the discrepancy between true solar time and standard meantime which fluctuates during the year but can be ahead by as much as 16 minutes (around November 3rd) and behind by 14 minutes (around February 12th). Solar and meantime are equal on just four occasions each year. Flanking the tourbillon aperture are two dual sectors for the time of sunrise and day length and time of sunset and night length in the user's home city. These indications are in fact another relevant factor in the Gregorian calendar in which the days are calculated from the hours of light and darkness and not strictly set times. Another watchmaking first is the 12-hour second time zone dial with separate day and night indicator window located in the 10 o'clock position: the second time zone is used in conjunction with the digitally displayed world-time function which gives a choice of 24 cities and countries and their respective time deviations from Greenwich Meantime. This thoroughly new and discreet 12-hour system of world-time mechanism and display is the first new system to be developed since Louis Cottier's well-known world-time system with 24-hour indication invented about 1935 and is therefore of major significance. other functions. Including the Hebraic perpetual calendar seen on the other dial, this watch has the ability to provide three entirely different perpetual calendar readings. The ISO 8601 business calendar is a specific system founded by the International Organization for Standardization and used mainly in the international financial sector for example in company accounting for tax years, payment of wages or rents due on a weekly basis, the planning of projects in weekly cycles, etc. The purpose of this standard is to provide an unambiguous method of representing dates and times, so as to avoid misinterpretation of numeric representations of dates and times, particularly when data are transferred between countries with different conventions for writing numeric dates and times. When times are also required under the ISO system, they are given using the 24-hour system and with time-zone information where necessary. Both these functions are also present on this dial. The ISO system has a full cycle of 400 years and employs a seven-day cycle with weeks starting on a Monday. However, an ISO year can have either 52 or in some cases 53 full weeks when New Year's Day falls on a Thursday (Wednesday or Thursday in leap-years): this occurs every 5 or 6 years. In the ISO system, week 1 is the one which contains the first Thursday of the year and always contains January 4th. The last week of the year in the ISO calendar is the one that contains the last Thursday and always includes December 28th. This system requires the user to adopt a different way of interpretation, for example: if the calendar is displaying Thursday, September 17th, the ISO calendar will read as day 4 in the day aperture (because Thursday is the fourth day) and W 38 (W for week) on the week dial. The mesmerising Armillary tourbillon cage containing the watch's escapement is visible through the aperture beneath the sky chart. It is both technically exciting and visually dramatic. The watchmakers at Vacheron Constantin have created the most supremely elegant mechanism that displays a three-dimensional constantly rotating sphere moving with the utmost delicacy simultaneously in three directions. 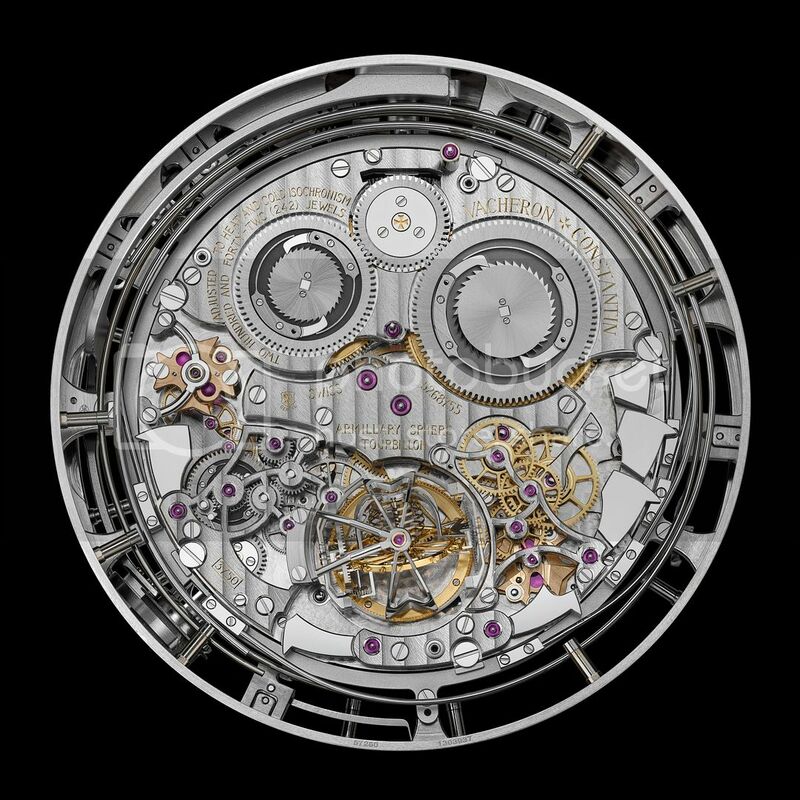 Appropriately, the watchmaker has also chosen to use a spherical balance spring which not only adds to the elegance of the mechanism, its special properties contribute to the accuracy of the watch. This tourbillon was named "armillary" because visually it is reminiscent of the circles and rings of the scientific instrument known as the armillary sphere. It was placed in the second dial side complementing the astronomical functions to suggest the apparent movement of the stars, the Sun and the ecliptic around the earth. The frame of the cage itself, made of ultra-light aluminium and carrying the escapement and balance, is ingeniously constructed to incorporate the Vacheron Constantin company symbol of the Maltese Cross, once every 15-seconds during the tourbillon's rotation, the Maltese Cross becomes fully visible to the viewer. The armillary sphere tourbillon is a feat of high-precision watchmaking. Made of the lightest of materials, its purpose is to minimize the effects of gravity on the balance wheel, hairspring and pallet fork of the escapement. The tourbillon is essentially a revolving platform and "cage" upon which the whole escapement is mounted that makes one full rotation in one minute. In this tourbillon, the escapement is rotated in three planes at once. The escapement has two further exceptional features: a spherical balance spring and diamond anchor pallets. Next Topic: Does this watch make me look fat?